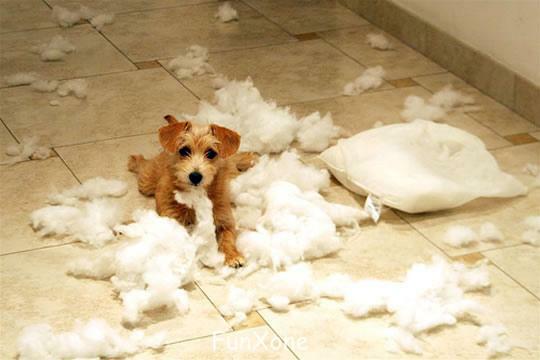 It wasn’t me, and I’m hungry… woof. When man began to wander the earth in search of food, shelter and a good place to spend a Friday evening that plays great music but not too loud so you can hear what your friends are saying, he began to get lonely. Luckily, man learned how to domesticate animals and his loneliness ended. It was a joyous time full of stick throwing and tummy tickling. He’ll never find me in here. Unfortunately, man and beast have never quite been entirely harmonious in their continued co-habitation. Animals will continually overstep their boundaries with regards to personal space and flagrantly disregard strict ground rules enforced with a shaking finger and an empty threat. How do they apologise for such outrageous behaviour? Not with flowers or a card; not with a poem or a well-put-together apology – oh no. A look is all they have in their arsenal of forgiveness, but when the looks they give are as sincere as this, we can do nothing but forgive the little blighters, even if they have just chewed your curtains to threads. Enjoy. I thought you’d prefer an open toe. Those big brown eyes are enough to forgive anyone for the most heinous of crimes. 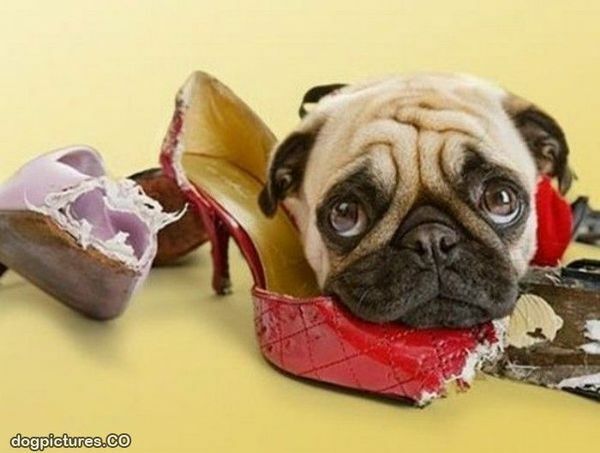 Chewing the ends off all of your favourite shoes could be the most productive thing this little chap has done all day, but you couldn’t stay mad at him for too long, not with a face like that anyway. You’ll thank us when we sell it for millions. It would be fair to say that if you decide to keep pigs as pets in the house, then a mess is always going to ensue. It must have come as a shock for this owner to discover his miniature oinkers trying to unleash their inner Picasso… all over their faces. I’m as disappointed in me as you are, honest. 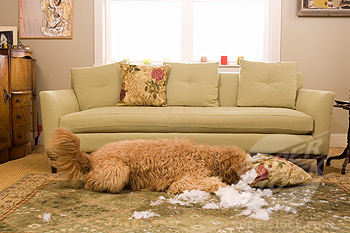 Dogs and soft things go together like old tower blocks and 300 pounds of industrial grade dynamite. In both cases you’re going to need more than a dust pan and brush to clean up after the event. But look at the little guy; he’s learned his lesson… right? 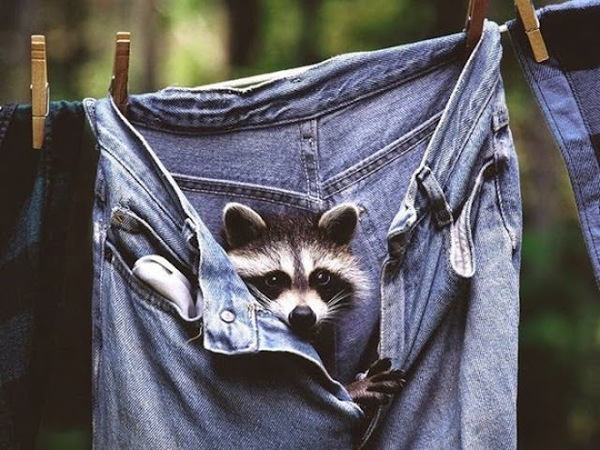 Our fabric conditioner comes recommended by raccoons. How often does a raccoon end up in your freshly washed jeans? Be honest; not very often. So, you can probably forgive our hero with camera for not chasing the little critter out of there the second they saw him. Anyway, no one can resist that ‘just been washed’ feel. 8. I would look better as a brunette, wouldn’t I ? Gaga’s new stylist was an odd choice. Dogs have never been that fond of hair extensions. This young pup has an excellent way of showing it. Anyone would take personal grooming tips from this little guy though; it’s one of the fringe benefits of being utterly adorable. We have no idea what we’re doing. Ah cats; the most mysterious of God’s creatures. 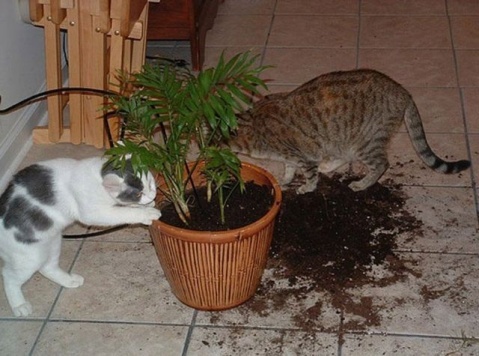 While most cats would prefer to mooch about the house not doing too much and generally holding themselves in much too high regard, these two have decided to do a little gardening. Although dogs are renowned for digging around in the dirt, you couldn’t get too angry at these little guys for doing it; besides, they probably wouldn’t care anyway. I saw this in a Fred Bassett cartoon once. It wasn’t funny then either. This guy certainly has a unique charm about him. 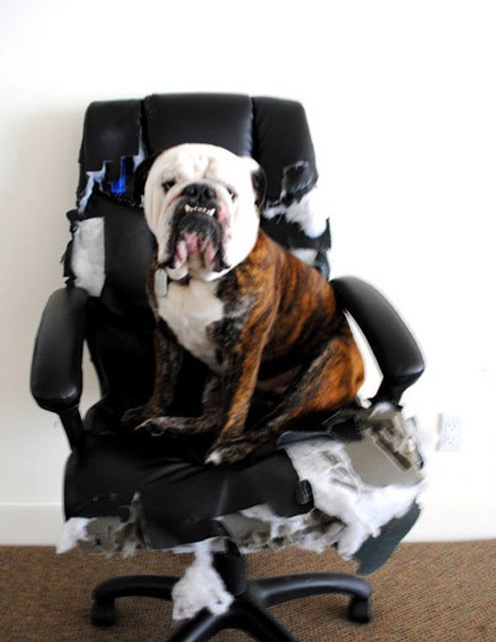 It would be unkind to be angry at a dog that looks so at home in an office chair, even if he has ripped it to shreds. If you put a tie on him and gave him a flip chart, he would probably look like our boss. 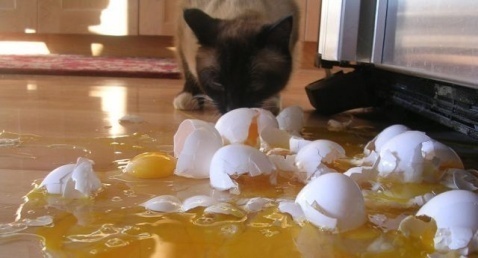 I may have misread the recipe… did it require eight or nine smashed up floor eggs? Cats and cooking are never a good mix. Besides breaking every egg in the fridge, they also have a habit of leaving cat hairs everywhere, which – let’s be honest – never really adds to the flavour. This does beg the question of whether Garfield ever made his own lasagne. Answers on a postcard. Can we get Quattro Formaggi next time? Ah, nothing beats the taste of day-old pizza… even when it’s spent the night in the bin with an empty box of Frosties and some napkins. 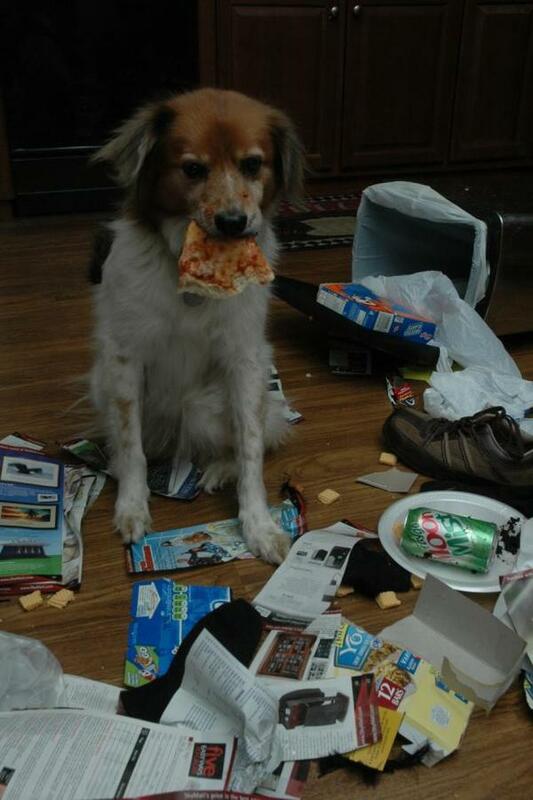 There’s something about this dog’s eyes that says ‘waste not want not’. Hopefully, next time you’ll order a smaller-sized pizza; so, in a way, he’s sort of helped you out. Think about that as you clean up his mess. Your birthday cards came. They were delicious. 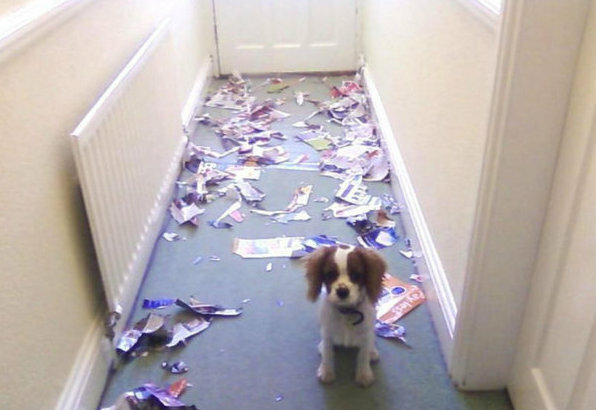 Dogs and postmen are not a good mix; just ask any postman on the face of the earth. There must be something so terrifyingly threatening about letters coming in through the post box that sets dogs off. Could it be the intrusion of a foreign body into the homestead or just the excitement at the most recent JC Penny sale? We’ve all become a nation of technophiles. I know it, you know it and this rabbit definitely knows it. 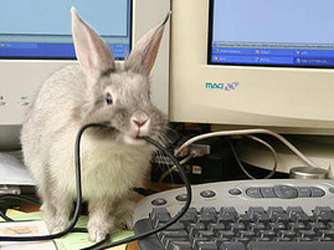 In all honesty, if you allow your rabbit onto your desktop, this is always going to happen. Never mind though; just look into those big, daft eyes, and all your frustration will be alleviated. This is always to be expected if you’ve opted for a hound the size of a small horse. 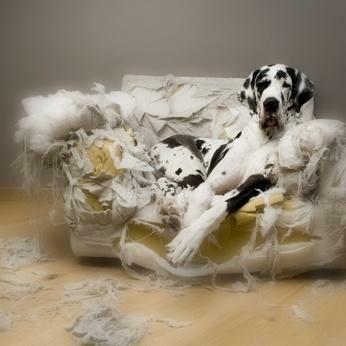 This owner chose to keep his Great Dane in a barn and paid the ultimate price, or rather, his sofa paid the ultimate price. He does look very pleased with himself though, and that seems to be the most important thing. 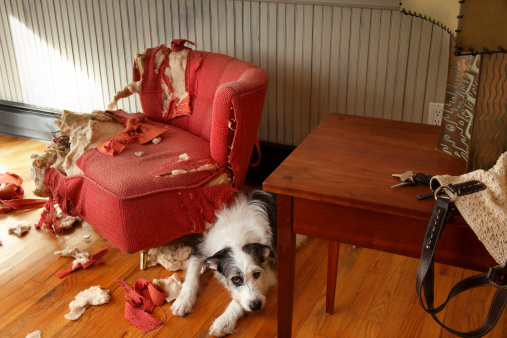 Well, there you have it; twelve incredibly naughty pets who were instantly forgiven the second they looked at their masters. As a defence mechanism, they could do much worse. Surely the greatest destructive pet is not one of these seen above but rather the hero of the incredibly popular web cartoon – Simon’s Cat. 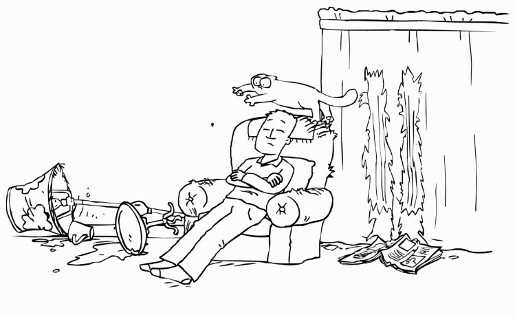 Simon’s Cat follows the exploits of a particularly destructive, but hugely loveable feline who, despite his best efforts, can do little right within his home, but is instantly forgiven by his long-suffering owner. It’s a must for cat owners everywhere.